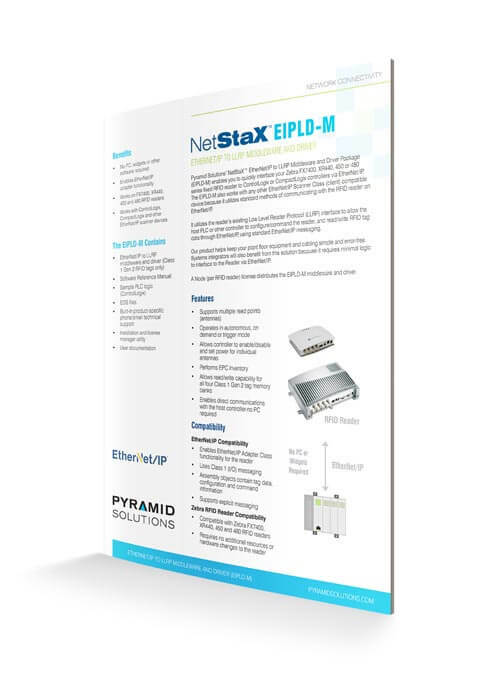 NetStaX™ EtherNet/IP™ Middleware and Driver Package (EIPLD-M) enables you to quickly interface your Zebra XR440, 450, 480 or FX7400 series fixed-RFID reader to Rockwell Automation ControlLogix/CompactLogix Controllers or any other EtherNet/IP Scanner Class (client) device. By utilizing standard methods of communication with the RFID reader on EtherNet/IP, you’ll see new life out of your equipment. 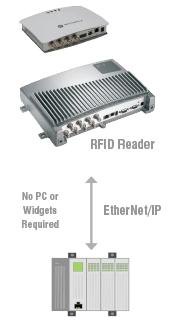 The EIPLD-M installable software includes middleware and a driver that loads onto a supported RFID reader to add EtherNet/IP Adapter Class connectivity to the device. It allows a PLC or other controller to configure/command the RFID platform to read/write RFID tag data directly through EtherNet/IP, using standard EtherNet/IP messaging. It does not require alternative PC or hardware/software which simplifies plant floor equipment and cabling requirements eliminating points of failure.